Johann is a Bard and Court Musician within the SCA. He resides along the southern border of the Barony of Black Diamond, in the Kingdom of Atlantia. Johann was an apprentice of Master Efenwealt Wystle until his own elevation to the Order of the Laurel. 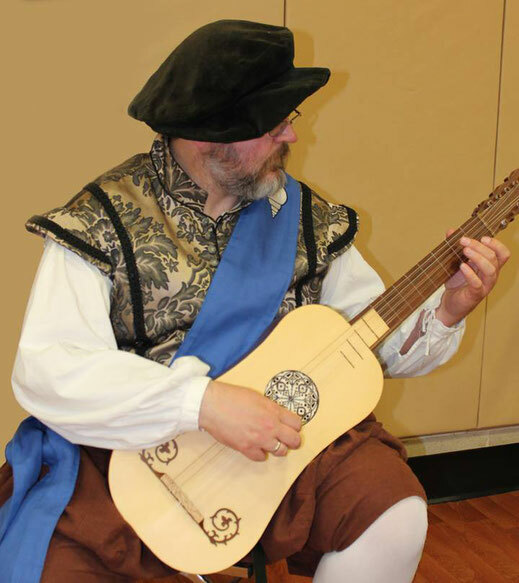 Johann has served his Barony and Kingdom as Baronial Bard, Royal Bard of Atlantia, and currently is serving his second term as one of Atlantia's Royal Players. In addition to performing period music and SCA bardic pieces, Johann writes original renaissance guitar, vihuela and lute instrumental music, original Period-themed and SCA-themed bardic pieces, teaches classes in his areas of interest, organizes performing activities for events, hosts and/or judges bardic competitions, plays music for dancing, and generally spends lots of time around the bardic circle. Johann's music/bardic and teaching activities have been recognized by Atlantia's AoA and GoA A&S awards (Coral Branch and Pearl, respectively), and more recently, by his elevation to the Order of the Laurel by King Cuan and Queen Signy.